Hi folks, Welcome to my blog..!! I wanted to write this post, considering the developers working on Linux embedded devices where the boot media is SD card. Its very obvious that developers have to change the images on SD very frequently to try their new changes incorporated, but the very frustrating or cumbersome thing is we will be having multiple partitions on SD card and the moment it is inserted on host machine for updating the images we have to wait until all the partitions mounted, and the same thing while un-mounting as well. To save time or to make things go easily I prefer SD card to be auto mounted but not opened, this will be very help and saves time and also we need not to spend extra time closing the opened windows by dragging our mouse leaving the key-board where we love to use commands instead of GUI. 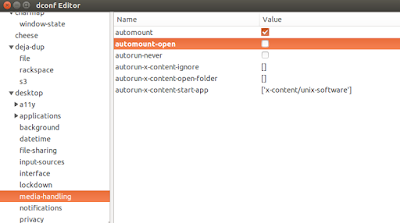 for doing that in Ubuntu 12.04 or 14.04 we have to install "dconf Editor"
After you install "dconf Editor" open the application, at the left side of the application you will see a menu with lot of options. 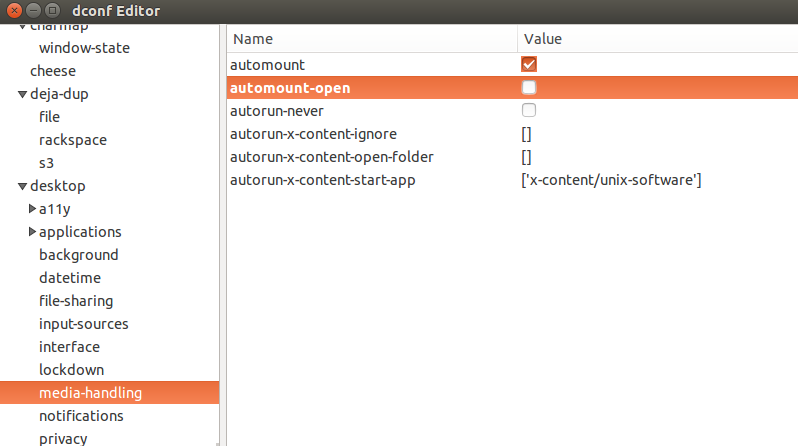 Goto -> "org"--> "gnome"--> "desktop" --> "applications" --> "media-handling"
after you select "media-handling" in the right side window you will see options as shown in the below screenshot. There are lots of option you find interesting with "dconf Editor".